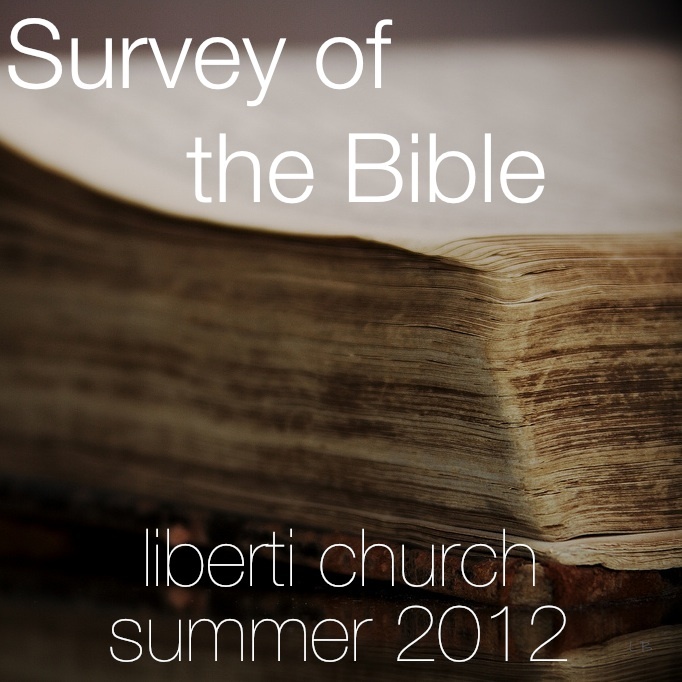 Throughout the Summer of 2012, I had the privilege of serving my church by teaching a Survey of the Bible Class. That’s right. In 6 weeks’ time, we went through a theology and history of the Bible as well as went through each of its 66 books. We went over their content, background, and application to life, spirituality, and the Gospel. We concluded with a discussion on how to use the Bible itself in our own personal spiritual lives. Below you will find audio of the sessions, as well as my notes for each week and a link to the blog post in which you’ll find a little more information on each individual lecture, and an embedded audio player and document viewer. I’m in the long process of editing this and adding to it, with the hopes of self-publishing this content as a book. Please feel free to comment on any lecture post with critiques, questions, disagreements, or requests for clarification. If you find yourself in the Philadelphia area, join us at liberti church center city, Sundays at 9:30am at 17th and Sansom St. in Center City Philadelphia.